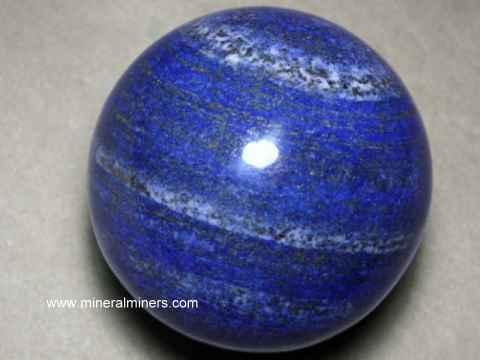 Lapis lazuli is a rock composed of a mixture of several different minerals including lazurite, huaynite, sodalite, noselite, calcite and pyrite. Diopside, augite, mica, and hornblende may also be present in small amounts. 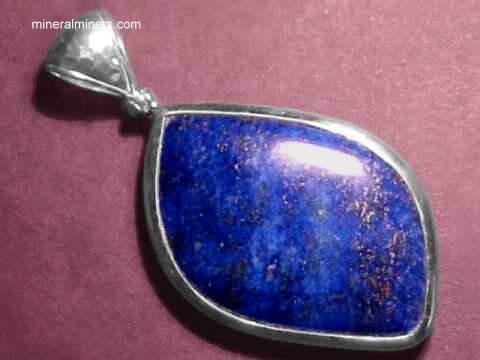 Lapis lazuli is imitated today by a number of methods typically involving the use of dyes on a variety of natural rocks and on synthetic materials. 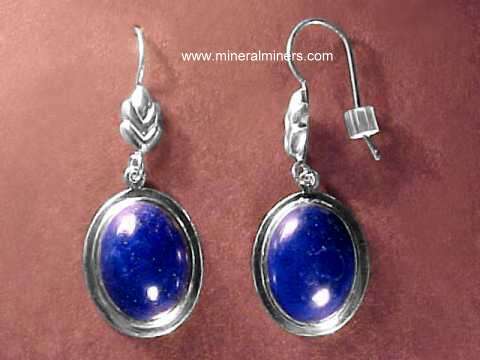 Some mineral dealers use dyes in combination with the crushing and reconstitution of lower grade lapis lazuli to make "re-constituted lapis lazuli". 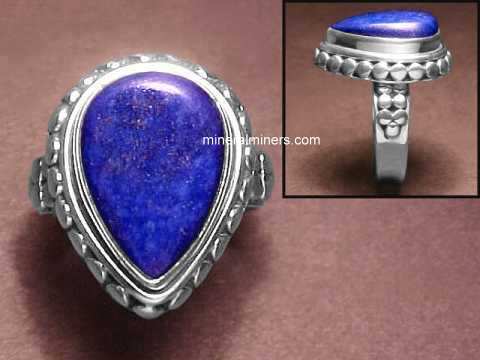 The term denim lapis is sometimes used in referring to lapis lazuli with lighter shades of blue. 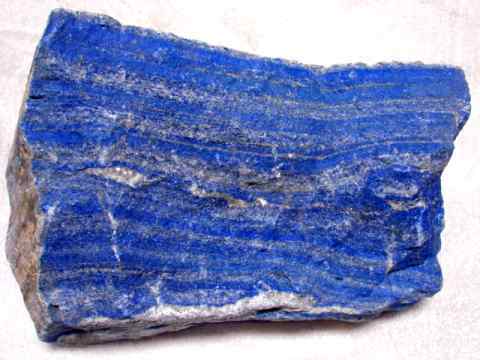 Lapis lazuli usually occurs in crystalline limestones as a result of contact metamorphism. 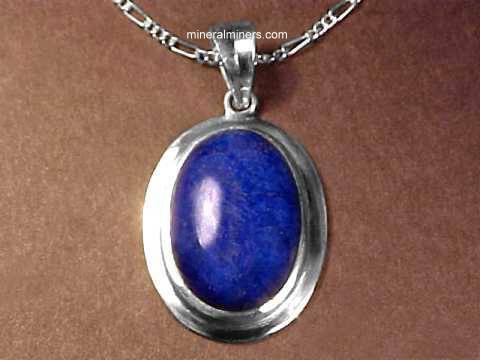 Lapis lazuli is characteristically recognized by its color. It yields H2S gas (smells of rotten eggs) when subjected to HCl. 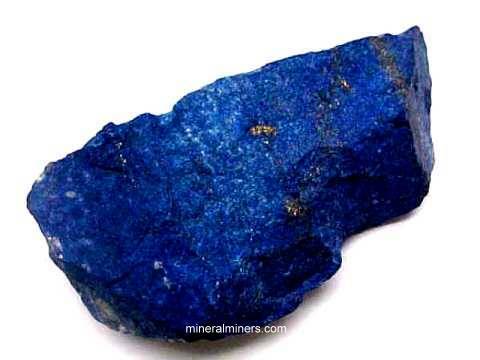 The presence of pyrite can distinguish natural lapis lazuli from many (but not all) of the lapis simulants. 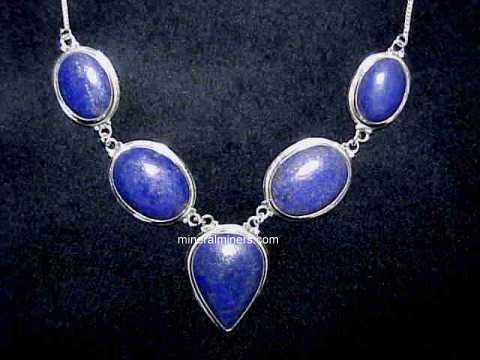 The name Lapis Lazuli comes from the Persian word lazhward meaning blue, in allusion to its color. 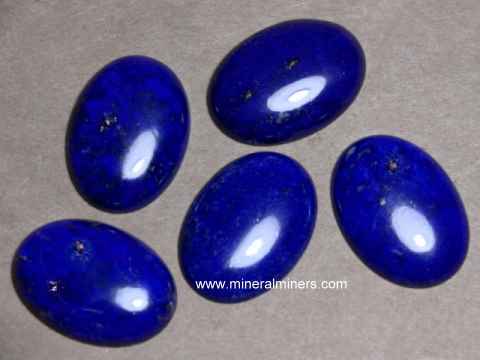 In ancient times, lapis lazuli was known as sapphirus, which is the name that we use today for the blue corundum variety sapphire. 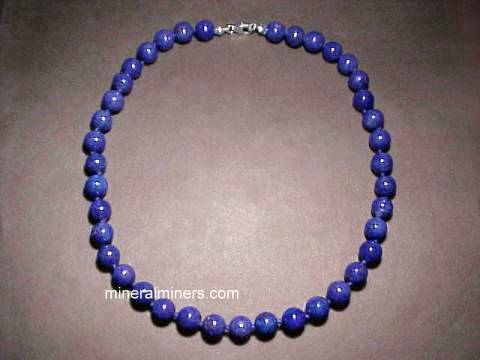 Lapis Lazuli has been highly valued for many thousands of years. 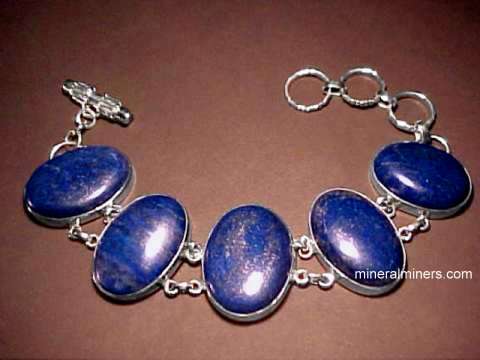 The most famous locality for fine quality lapis lazuli is the same ancient deposit high in the mountains of Afganistan where it was originally mined more than 6000 years ago. This location near Badakshan is still mined today. 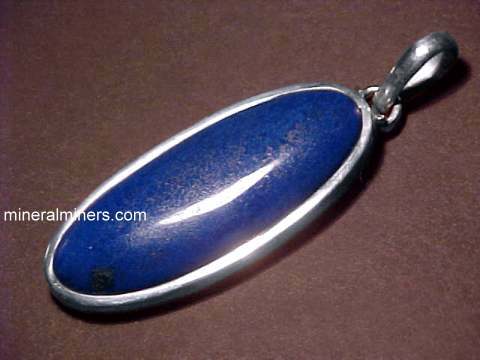 Lapis lazuli was often made into jewelry, carvings, amulets and talismans which were believed to have occult powers. It was used by the ancient Egyptians in many religious ceremonies, and was often used as an inscription stone for various passages from the ancient Egyptian Book of the Dead. 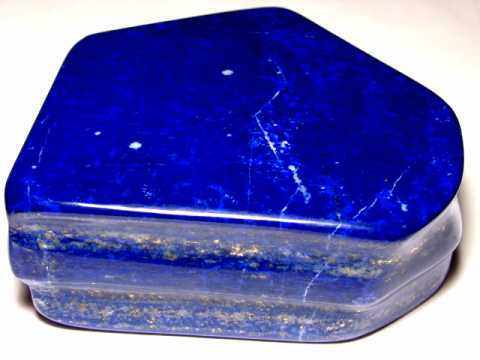 Lapis lazuli was one of the stones in the 'Breastplate of Judgement' of Aaron, described in the Bible (Exodus: xxviii, 15-30). 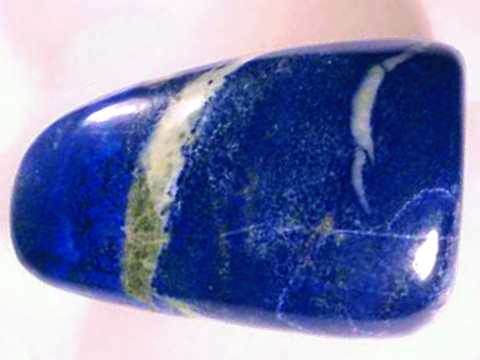 Lapis lazuli was said to dispell melancholy and depression, and to cure recurring fevers. It was also said to impart ancient knowledge, and the wisdom to use it. 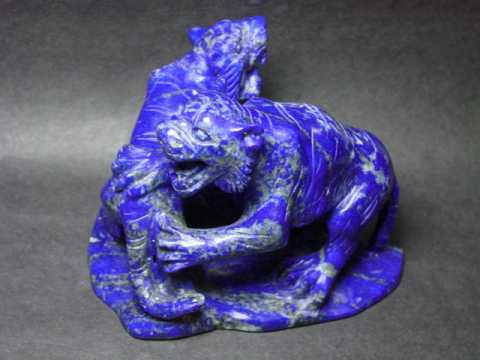 Up until the nineteenth century, lapis lazuli was ground up and mixed with oil to produce the deep blue-green pigment known as ultramarine which meant literally beyond the sea, as the lapis lazuli was brought from far away by ship. Since 1828, this pigment has been produced synthetically from a roasted mixture of kaolin clay, sodium sulfate and charcoal. 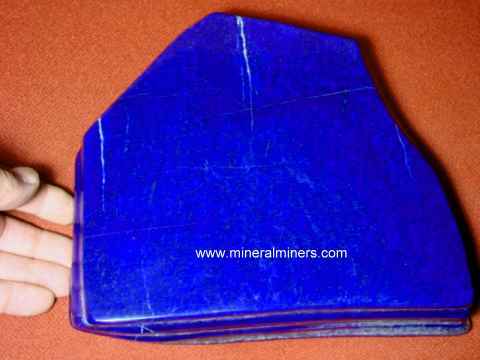 Lapis lazuli today is still a very popular lapidary material. It is made into a variety of hand-crafted objects such as carvings, spheres, beads and cabochon gems, as well as a great variety of lapis lazuli jewelry items. 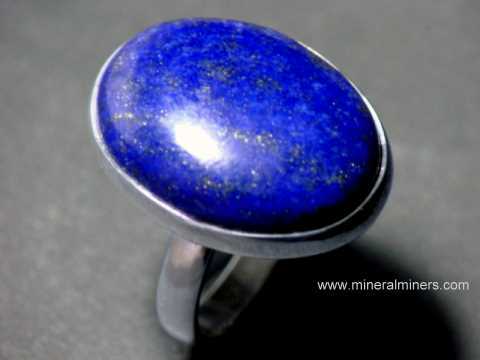 Lapis lazuli is said to enhance one's awareness, insight and intellect. It is also said to impart ancient knowledge and wisdom, bringing peacefulness and self-acceptance. Lapis lazuli is said to help cure depression, insomnia, recurring fevers, vision and hearing problems, and disorders of the throat, lungs and immune system. 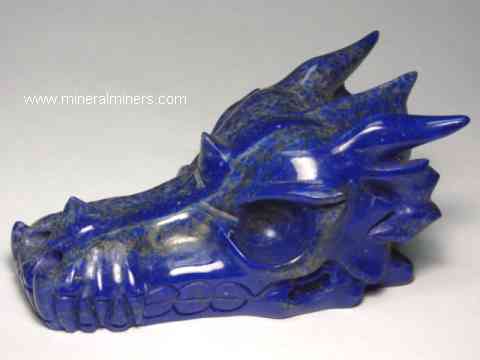 To see more lapis lazuli items, just select any image shown below.